Tensions quickly mount as Korean-American Kyung’s proximity to his parents forces old feelings of guilt and anger to the surface, along with a terrible and persistent question: how can he ever be a good husband, father, and son when he never knew affection as a child? 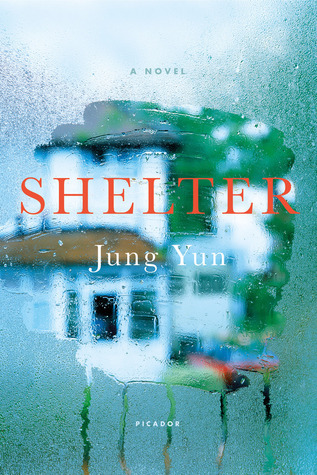 Shelter derives almost all of its drama from family dynamics, yet it manages to read like the most suspenseful of thrillers. Yes, the family arcs involve plenty of violence — as well as a few truly jaw-dropping turns of events — but the shifts and swerves of these relationships have their own intense propulsion that compels on a purely emotional plane. None of Yun's characters are particularly likable; some of them cross lines that seem to preclude forgiveness. But even the monsters are recognizably human, and the Cho family's redemption remains worth hoping for, even when it seems impossible and undeserved. Race politics weave throughout the novel but the most interesting commentary on race and ethnicity lies in its critique of the American dream through the parallel stories of an unhinged family, the housing crisis and a random act of violence ... The novel is gripping, more so for its plot than its prose. Even when the nar­rative feels a tiny bit over the top, you are compelled to turn another page. The flat tone of the writing keeps the story from being melodramatic — it keeps excess at bay. The combination of grisly James Patterson thriller and melancholic suburban drama shouldn’t work at all. Yet Ms. Yun pulls it off. Kyung is petulant and unlikeable, but he’s also psychologically unstable. The proximity of his parents and the atmosphere of grief and panic launch him on a spiral of self-destruction that’s impossible to turn away from. The novel grows darker and darker, until all its internal contradictions are eclipsed by an ending as disturbing and bereft as anything you’ll read this year. What did you think of Shelter?